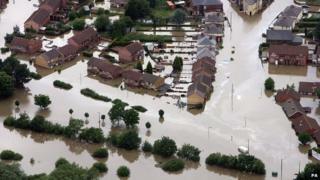 Flood defence work in South Yorkshire that would require millions of pounds in government funding has been backed. Sheffield Council's cabinet has backed five schemes to prevent a repeat of floods seven years ago. Around 6,000 households, 2,000 commercial properties and key transport routes are at risk of flooding over the next 50 years, the council said. Now, officials are putting together business plans to secure much of the £55m envisaged cost. Work is already under way on a £19m scheme to improve defences in the Lower Don Valley. A £12m flood alleviation programme on the River Sheaf. A £12m scheme in the Upper Don, including the rivers Loxley and Rivelin. An £8m culvert renewal programme in Sheffield. Almost £3m to manage surface water from planned developments on the Manor and Arbourthorne estates. A £2m scheme for Upper Blackburn Brook to benefit 233 households in the city. The five schemes total £37m and it is proposed that £23m of this will come from a central Government grant. If funding is gained the full programme is planned to be completed by 2021.